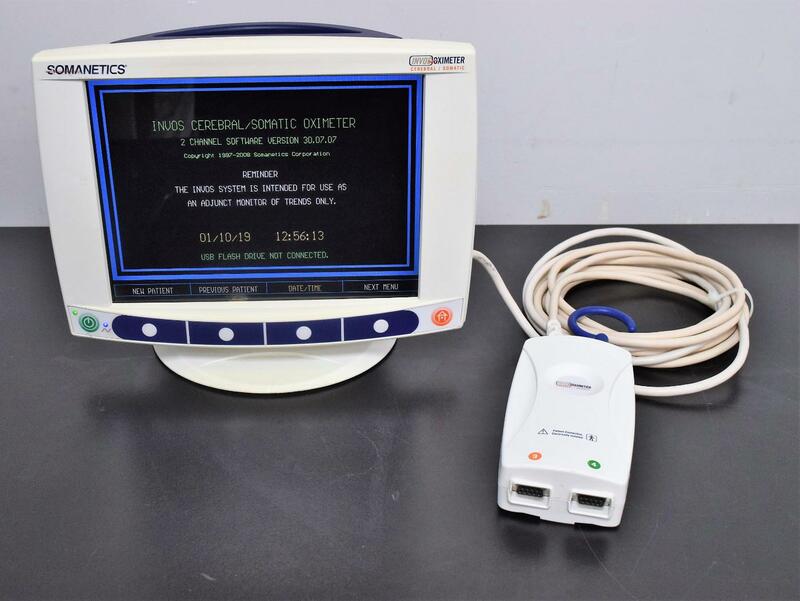 Somanetics Invos 5100C Cerebral/Somatic Oximeter for Regional Oxygen Saturation . New Life Scientific, Inc.
It’s able to navigate through all the menu functions. But without a probe, no further testing could be completed. It’s in good cosmetic condition with a minor spot in the bottom of the screen (shown in the second image) that does not affect its capability of working. It has a continuous recording and display of readings of regional tissue hemoglobin oxygen saturation. It’s intended for use as an adjunct trend monitor of regional hemoglobin oxygen saturation of blood in the brain or in other tissue beneath the sensor. Testing was completed on the acknowledgement in powering on the monitor and navigating through different screens with the buttons, all working properly. Noting that there is a spot (7th Picture) on the lower display screen but it doesn’t hinder any viewing of the graphics.